Meg and I agree we have a lot to celebrate. Today I want to celebrate and share more of Kansas City’s graffiti. My weekly adventures often provide we opportunities to find new murals throughout our urban community. These paintings were found just barely Southeast of downtown. 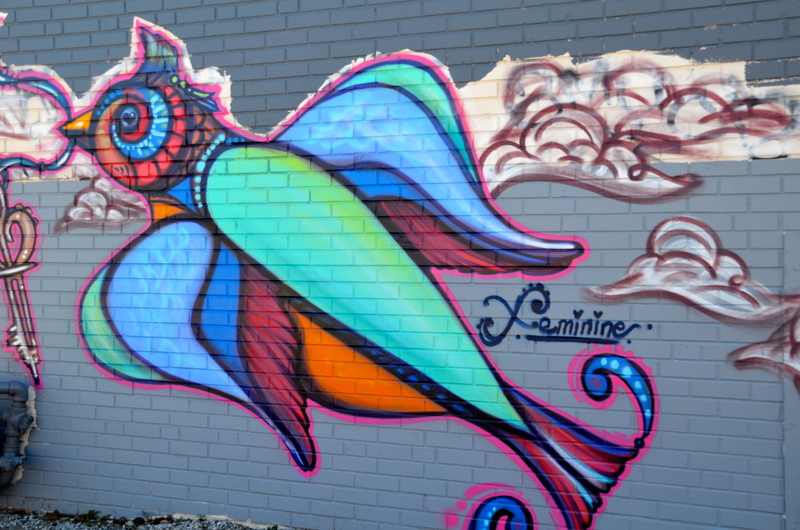 The artist or artists plying their trade on this freshly painted wall obviously love color. There were at least half a dozen individual paintings extending from one building well into the alley just East of Grand within a 7 minute walk to our center city. “Feminines” is almost certainly the artist’s signature on this wonderful rendition of a mythical bird. 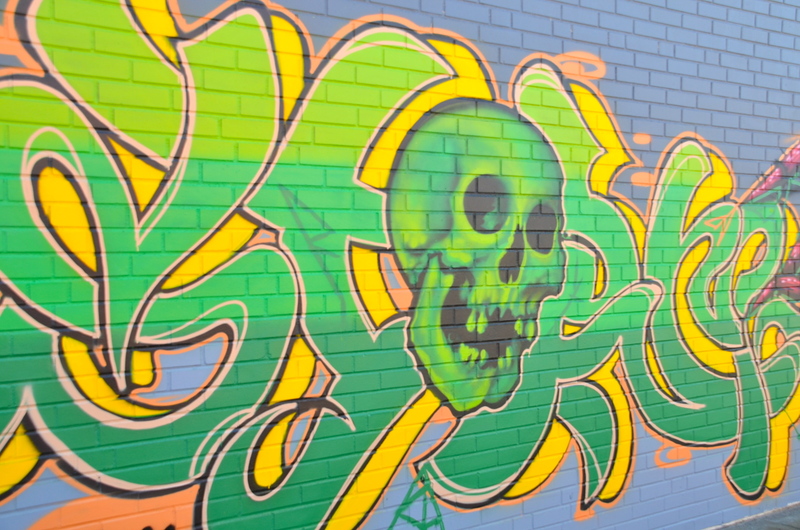 While renditions of death are very unusual on wall art, this skull seems to smile from the wall. The shocking pink on this final mural adds to the festive nature of this block in Kansas City. Live in a city? Hope you enjoy the wall art where ever your route takes you. It is, in the best sense, the people’s art. 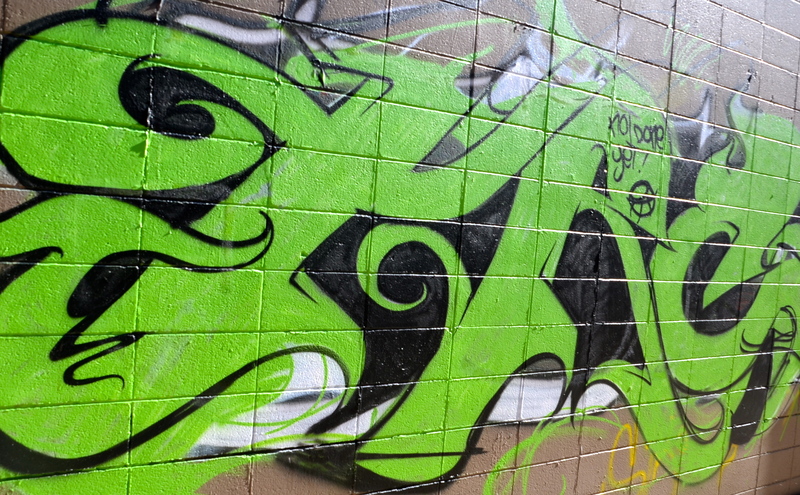 This entry was posted in Community, Photography and tagged Art, Colorful, East Side, Graffiti, kansas city, People's Art, Urban Art, Urban Culture, Wall Art. Bookmark the permalink. Okay, we really must go for a graffiti tour! There is such a minor distinction sometimes between true graffiti, that is removed, from murals that are created with the consent of building owners. 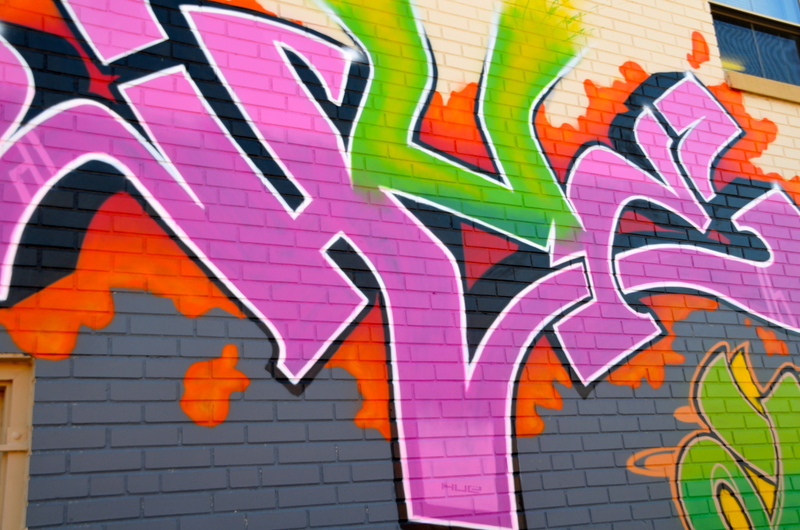 Many commissioned wall murals are create in the same style as graffiti. Kansas City SMS to have a welcoming view to art painted under bridges, on buildings and in alleys. So mch of it here is obviously commissioned or the work of highly skilled artists that it is usually left I disturbed unless it is gang related or appears to be the work of vandals.